Whether you’re a seasoned Spinning student or a complete newbie, there are several things you need to consider when you’re on a Spinning bike. Realistically, you CAN hop right on and start pedaling. But that’s not really the point of an actual Spinning class. We instructors do our best to challenge you with resistance and heart rate variations, all of which combine to create an efficient workout. But it’s your engagement with the bike that makes or breaks your experience. Spinning instructors cue from start to finish, offering hints, tips and directions to help you make the most of your workout. But when you’re on the bike, sometimes you get lost in thought, sweat or fatigue and you miss these cues. So today, I thought it would be fun to break down a Spinning class. Let’s start with getting ready. Riding with cycling shoes is an added bonus, but will not break your experience. The same cannot be said about water. Come to class with it, no excuses. And wear a heart rate monitor if you have one. And most importantly, if you don’t know what your bike settings are, then come early and ask for help. Riding a bike that isn’t properly set up can and probably will lead to injury or discomfort. 1) Assess bike performance. Never ride a broken bike! 2) Assess your body. Address any issues. 3) Tune into the task ahead of you, not the rider next to you. 1) Flats: These can be done seated or standing. Always make sure you are connected to the road, which means that you should always load up some resistance on the bike. If you are standing, more resistance is necessary to balance out the change in movement. And when it comes to flats, know that they aren’t always meant to be easy. If your instructor cues an active recovery on a flat, make sure you keep working at an intensity that allows the heart rate to level out. 2) Climbs: These can also be done seated or standing. It’s up to you to make them hard because you control the resistance. They are meant to challenge you. Listen to your instructor and adjust accordingly. Do not be shy! If you don’t push yourself, you won’t make advances. Going light on a climb is only necessary if/when you feel like it’s too much…going light on a climb when you don’t feel like putting forth the effort, or when you’re too busy chatting with your neighbor to really engage in the task at hand…that’s how you kill your workout. That’s how you miss out on the benefits. So sit back in your seat a little bit, find your gluten and hamstrings and really dig into the hill. 3) Sprints and Jumps: Advanced moves and the reason you need to stay tuned in to your ride. Because it’s always your ride, no matter what the instructor is cuing. Seasoned students should jump and sprint at an intensity that makes sense for their fitness. Do what you can, when you can. Don’t worry about your neighbor. One thing to always remember: Breathe through the intensity. 1) Reduce the resistance and give in. 2) Close your eyes and take a few deep breaths to encourage calmer breathing. 3) Drink the rest of your water. So you stayed for the cool down. Now it’s time to stretch. But you gotta go and you feel fine so it must be acceptable to skip the stretch. Brutal honesty: This is stupid. 1) If you must leave early, stretch on your own outside of the Spinning studio. 2) If you stay, commit and enjoy the stretch routine your instructor has prepared. 3) Don’t bounce. Never bounce while you stretch. Question: How do you feel about Spinning? 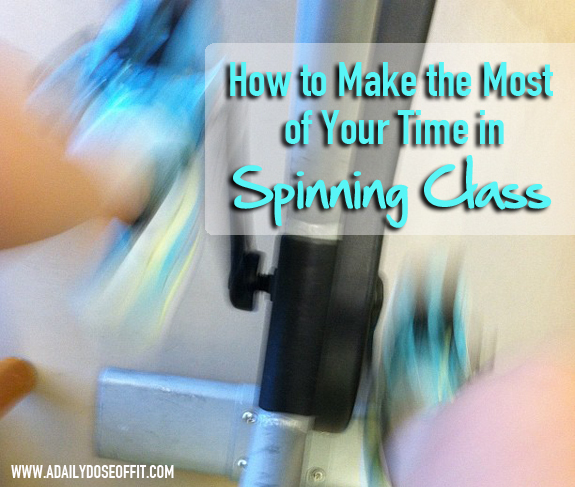 What is your favorite part of a Spinning class? Love it! I'd also avoid bopping side to side while standing, its wastes energy and can only lead to injury (at least in my understanding). You're right. There's a natural sway that happens, but a lot of riders overemphasize it and waste energy.